New York City: Beso | Five. Beso was the perfect place. Of course that’s not true: I’m sure there were rats in the kitchen and expired meats and rocks glasses with old lipstick stains still on the rim, but I don’t care. It’s closed and I’ll never get to go there again, so just let me have this one thing, this totally fantasized memory of my third place. The walls were a stunning mural of flora in lime and Kelly greens; the menu was “pan Latin,” which is a fancy way of saying everything was spicy and had cumin in it, everything came with salsa, and everything was fried. And there were margaritas. Oh, boy—were there ever margaritas. The first time I ever had a margarita, I was 21 years old and deliriously in love,visiting the girl of my dreams in San Francisco during a summer she spent there puppeteering and being a protest-mime for hire. We ducked in to an amazing divey Mexican bar in the Mission, after marching ourselves out of the worst gay bar either of us had ever seen. 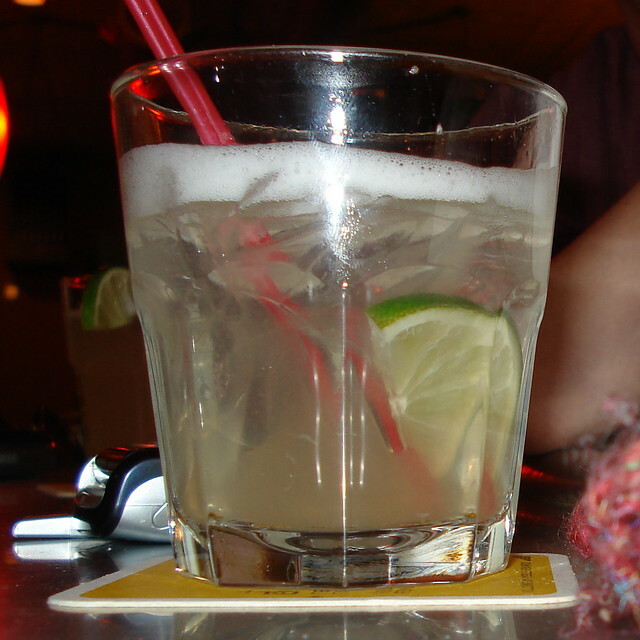 We walked in during a fútbol game, and everyone was shouting and twirling flags and scarves in the air; she ordered margaritas for both of us—I’m not sure why—and I almost went into total-body shock after my first sip. Did people really consume this much alcohol at a time, in a single drink? (I was new to the stuff; it’s a long story.) I scooted the drink toward her, and she finished them both; I nursed a Diet Coke and rum instead, grumbling because this totally Spanish-speaking bar full of recent arrivals to the United States did not have anything remotely resembling a Mike’s Hard Lemonade on offer. If I could remember the first time I walked in to Beso, I would tell you: If I could remember the last time I walked out, I’d tell you that, too. I do remember that I always ordered the “Latin fish and chips”—deep-fried strips of cod coated in thick and crunchy batter, of course with plenty of cumin, and a tower of yucca fries with salsa to dip them in. I never took salt on my margarita because I was still kind of an idiot about alcohol, but at least I knew not to order them frozen. At least I knew not to get a flavor—not mango, not strawberry—and at least I knew not to drink them out of the stir stick. The waiter with whom I became waiter-patron friends was named Efraim; he was from the Dominican Republic by way of the Bronx, and he loved motorcycles and cars (me too) and women (me too) and Pablo Neruda (me too). We talked about writing—letters, poetry, a film script he’d been dreaming about—and girls, booze and driving fast and seeing the world. He knew to only come by my table when I’d put my pen down; I knew to tip 50% when most of my drinks didn’t show up on the menu. We joked about going to the lesbian bar down the street together; he told me about arguing with his girlfriend, whom he really deeply loved. He told me about his family. I told him I wrote letters not because I was lonely, but because I liked the notion of sending someone a physical momento of the amount of time I spent thinking about them. I told him I was more honest in my letters than I was at any other form of communication, even with my girlfriend. He brought me another margarita. I left a bigger tip. One day, after I’d had my heart truly trampled and was spending more time at Beso with Efraim than anywhere with anyone else in my life, I wrote a letter confessing a crush to a friend who was barely a friend. A friend who closed the door on me because I was an idiot and drank too much no-salt margarita and said vulnerable things that were out of line. At least, I guess they were out of line: I don’t remember what I wrote—that’s pretty awesome, huh?—but I never heard from this friend again, never in any way. She just gracefully dimmed, like the house lights before a movie you regret paying money to see. It got dark in the theater and I was left with the memory of the stupid predictable plot I’d written for us, rejected by audiences everywhere. The next time I went to Beso, I found it closed. Completely closed—gate pulled and locked, mail stuffed forcibly between the metal chinks as though the mail carrier was as angry and felt as betrayed as I did, how dare you just shutter like this without telling me. How dare you abandon me when I need you. How will I write this apology letter without you? Where will I eat yucca in Park Slope now?? WHY G-D, WHY?!? Two months after Beso closed—and, as it turns out, its closing was the same old New York story of rent hikes and absentee owners and untold numbers of free drinks flowing like water to ungrateful sonsofbitches like myself— I got a text message from Efraim, though I didn’t remember (I sense a trend here) giving him my number. I have no idea what he meant by “circus” except I guess the real circus, big top and a dozen clowns in a Volkswagen and the whole nine. I appreciated his creative spelling of “ladies.” I missed him a lot—but I never wrote back. I regret that now. I regret a lot of what I did back then. I regret a lot of my time at Beso. But I’ll never, ever forget it. Reblogged this on WORLD WIDE WRITERS' WEB [WWWW].